When it comes to speakers you can buy them in all sizes and connectivity options. You can have a cheap Bluetooth speaker or a fully-fledged home theatre system. But what you want a single unit that can satisfy all your audio needs and can hook up to any multimedia system you want. Sony Electronics is on it with its new MHC-V50D High Power Home Audio System. The MHC-V50D is the first of its kind to arrive in India. The MHC-V50D has been priced at Rs. 33,990 and will be available across electronic stores and Sony Centre shops from July 13th. 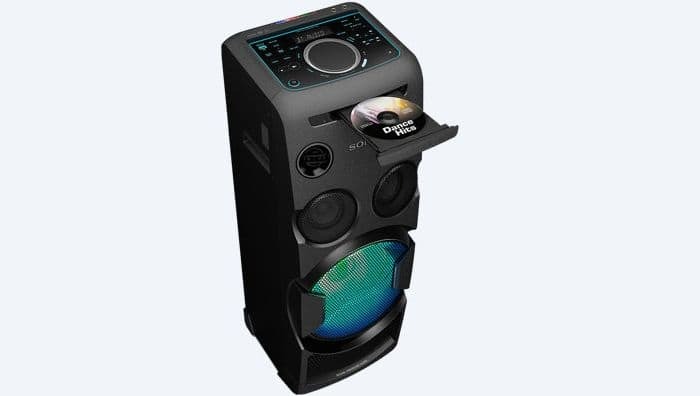 You are obviously thinking that for this amount you can get a 5.1 THX certified surround speaker such as the critically acclaimed Z906 system from Logitech. If surround sound is your need then you may settle for the Z906 but if you wanted a smaller slightly portable speaker system for your living room without the hassle of wires then the MHC-V50D is your best bet. Plus it has some amazing features that you might not find in any other speaker system. At its core the Sony MHC-V50D is a single unit speaker system with 2 tweeters, 2 midrange units and a woofer. The Sony MHC-V50D gets interesting with its connectivity options. 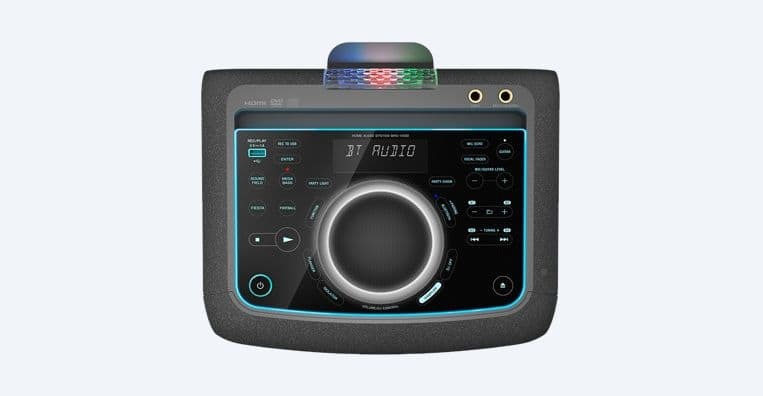 You can use Bluetooth and NFC to connect your smartphone, analog audio input and HDMI input to hook up your TV, two microphone inputs for karaoke and even plug-in your guitar. The Sony MHC-V50D also has an in-built CD/DVD player. This means you can hook it up to your TV to watch movies and listen to your old CDs. If you have a digital song collection and do not want to go though the hassle of burning a CD you have the USB port. Sony even gives you the option of copying music from your CDs to your USB drive. The Sony MHC-V50D’s user interface is an illuminated control panel with touch sensitive keys. 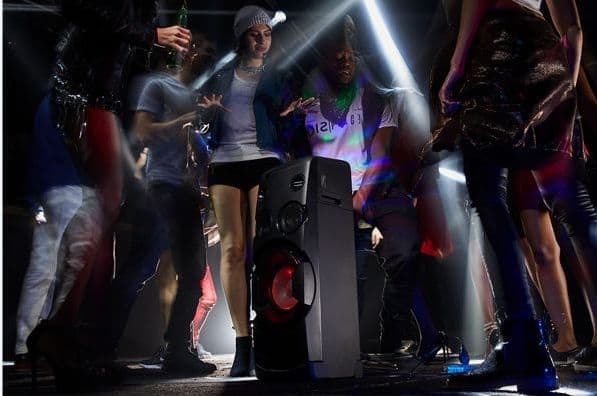 The Sony MHC-V50D can be a great party addition with the help of the below mentioned features. You can use the Fiestable app on your smartphone to add DJ effects like flanger, WAH distortion, isolater and PAN sweeps to your music. No matter which source you are using USB or CD you can change tracks with help of gestures on the aforementioned app. 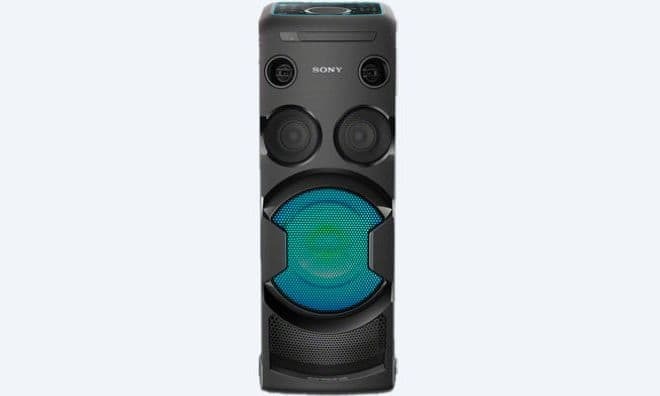 Unlike other tower speakers which may have lights for decorative purposes, the Sony MHC-V50D takes party lighting to its next level by redirecting them though a lens and spreading it across the room. You can even sync the lights with the music and start a dance party. The Sony MHC-V50D even throws in an FM tuner. You can use sound enhancement capabilities such as Bass Boost, Music Equalizer, Video EQ, Football Mode and ClearAudio+ courtesy of Sony. As we said earlier the Sony MHC-V50D is relatively portable as compared to other speaker systems and with the help up the built-in handle you can carry it around with some effort as the speaker weighs 14Kgs.